Basic Nether Ores spawn vanilla ores in the Nether. Simply put, this mod extends the ability for the player to mine ores and gems in the Nether giving the Nether new life and meaning. 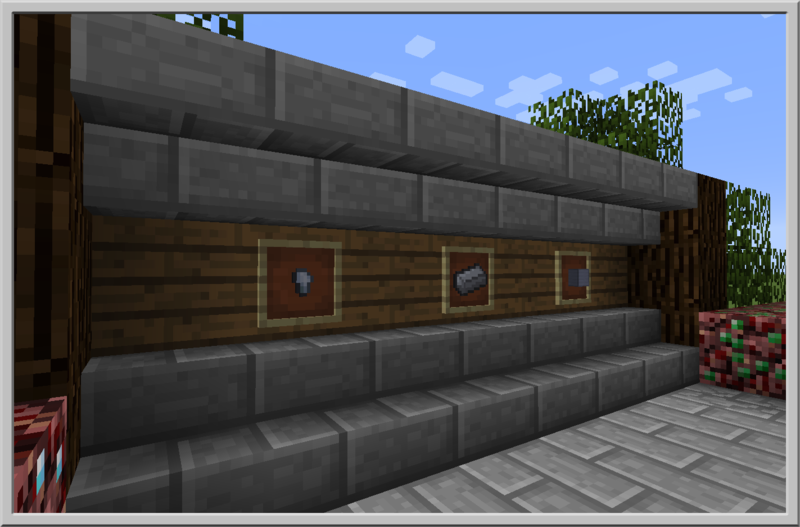 Copper and Tin ores have been added to the mod for function in other mods. Spawn rates for Nether Ores are set equal to or higher than their vanilla counterparts to make mining the Nether worthwhile. 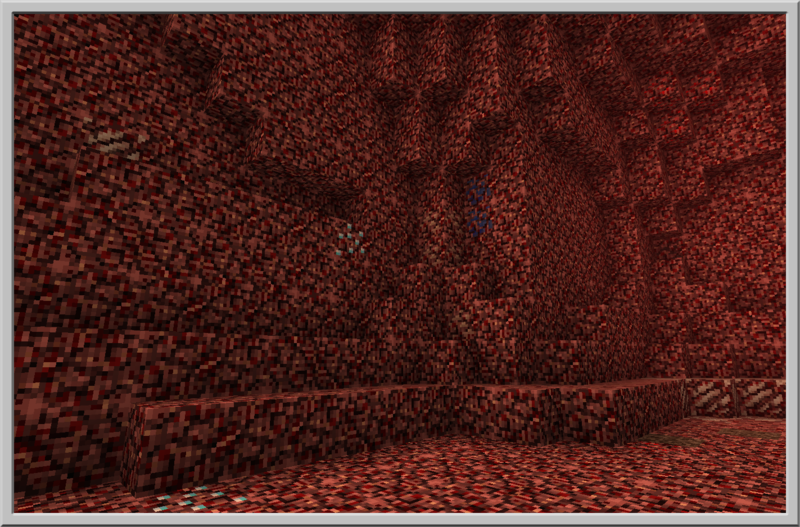 Texturing is not over done making the player pay attention to the surrounding areas to identify Nether Ores. What benefit does Basic Nether Ores bring over other Nether Ore mods? 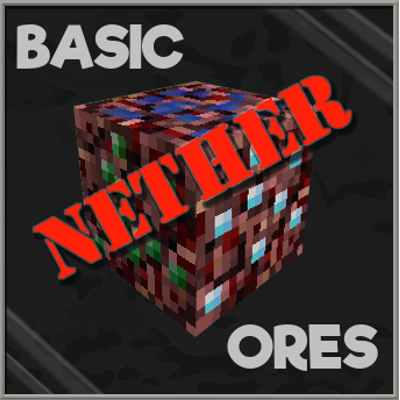 Basic Nether Ore is a stand alone mod and does not rely on other APIs or mods. All Ores, Block, and Items are assigned an Ore Dictionary entry to match their vanilla counterpart. Ore Blocks can be smelted to return one ingot like vanilla ores. I do see you possibly plan on adding more ores to the Nether, I was just curious to know if Silver was planned on, and if it was next. Thanks! 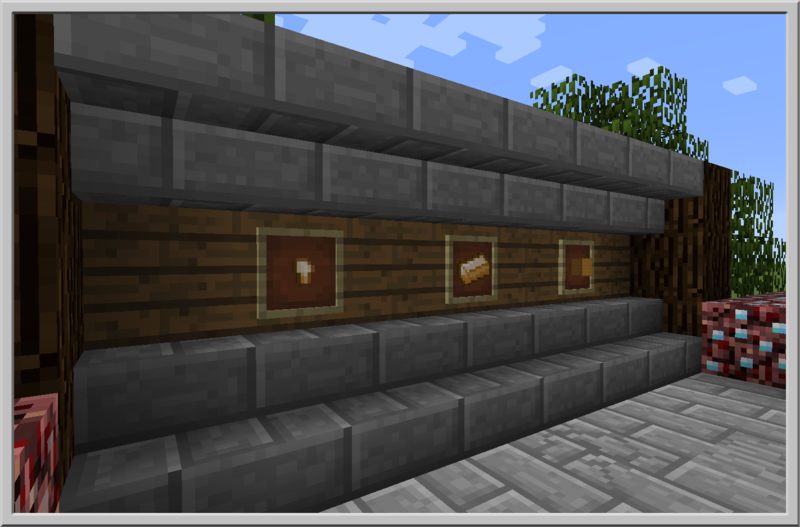 When we update we have thought about adding some addition ores to the mod. Originally this was developed specifically for a certain pack and we didn't need any additional ores, but as I see more people using it we will probably add a couple of more common ores to it. Would you consider adding a config option to double the output from nether ores? For example, furnace provides 2 ingots from 1 nether ore, and Tinker's construct smeltery gives 4 ingots from 1 nether ore.
Yea I think next time I update it that could be a possibility for the furnace. As for TC, not sure I would have to look into it. It may be easier to use Craftweaker to get that sort of integration. Does this Mod have compatibility with Sphax? I personally haven't created a texture for Sphax and haven't looked to see if anyone else has. You need to go to Venus, and try to mine Venus rocks. Usually you get log spam with errors, and if you try to veinmine Venus rocks, you crash. Not sure why only Venus, Moon and Mars works fine. Why i think that's your mod cause? Becuase i removed it, and now it works fine. I'll take a look at it but I think I have a good idea what is going on. Give me a couple of hours and I'll see if I can reproduce and get an update. Thanks for bringing this up. Updated to version 1.0.4 and it should fix the issues you were seeing. Thanks again. Any chance to have config option to generate ores in filling block other than netherrack? For example, BoP has biome with ash block as filling and meat block for heap biome, also soul_sand can be filling block in others. Mod called NetherEx has 4 different type of netherrack as filler blocks. All these biomes stay empty of ores if there is no option to specify which block to generate it in. Otherwise great mod, thank you! You must have been reading my mind. That is one of the next updates that I would like to add. It may be a bit but I think it would really help in the nether to be able to identify which blocks you want them to spawn in and support some of the other nether mods out there. The newest update has the ability to specify which blocks the Pigmen will protect so it should only be a bit before we get further capability. Thanks its been a ton of fun to work on. 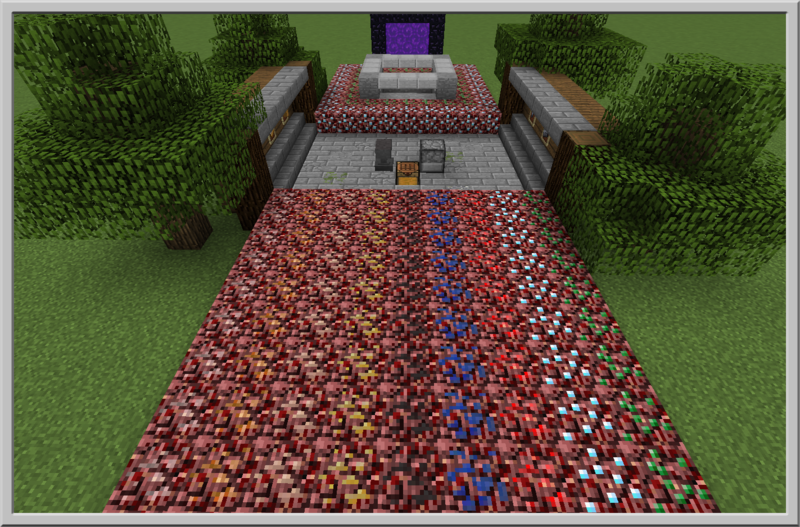 This mod is simple but great, makes the nether slightly more interesting and useful. If you use LB PHoto Realism for textures, I made a patch for this mod. That is awesome. Thanks for making the patch. Very good mod! I am sorta worried about rarity of Nether Diamond, found about 7 in the proximity of the Portal itself, is this normal? The initial set up that I had made them a bit more prevalent as this mod was used in the Primal Skies modpack and it was one of the only ways to get early resources. The configuration file should allow you to increase the rarity of the ores as you see fit. Hope this helps. I'm suffering from crashes when mining in the Nether. Your mod is the first in the stack trace, so I'm guessing it is at fault. However, it may also be an interaction with the other mods I've installed. The crash occurs as soon as a Basic Nether Ore block is about to break. The break noise and associated graphics never happen, instead the game freezes, then proceeds to shut down with an error in the Log file. Looks like it may have something to do with Multi Mine. Give me a bit and let me see what I can figure out. From the stack trace, you could be right. But I really like Multi-Mine because I don't have to start over from the beginning if my finger gets tired hacking away at a block of obsidian, or if my mouse slips a bit and I hit a neighboring block. It's also useful for breaking blocks that are otherwise out-of-reach (like that last block in a tree - I can jump to strike it, making multiple jumps and strikes, to eventually break it). And, in the rare event I play online and multiple people are hacking away at the same block, our efforts add together. It is a very useful mod! To test your hypothesis, I removed Multi-Mine from my mods. Breaking three different Basic Nether Ores blocks did not crash the game. Thanks for bringing this to our attention. Found the issue and it's been updated in the most recent version. Thanks again.